Palo IT Blog - Demystifying Agile – Applying Agile methodologies to non-software development projects and teams. Demystifying Agile – Applying Agile methodologies to non-software development projects and teams. My experience in startups and PALO IT has taught me that Agile practices don’t only apply to software development teams. Agile represents a new way to increase the efficiency of your teams, respond to changing requirements, and deliver value to your clients. Agile only works for developers and software? It’s true that the Agile Manifesto was written for software development. However, the underlying “why” behind the values and principles of the Agile Manifesto is all about increasing adaptability and delivering valuable outcomes for your customers regardless of the domain. It allows companies to flourish in markets that are increasingly uncertain and complex. Agile helps businesses deliver instant value at scale. For organisations to survive the volatile market, they found it rational to embrace Agile. Today, there are over 70 different Agile practices, many of which are still evolving. In this article, I will seek to bust the myth that Agile is only for software development and explain how it can be applied to your non-software development teams. Make budgeting great again – The flexibility of Beyond Budgeting start! At the heart of traditional project management, the budgeting process and the budgeting mindset is still king. Organisations are used to drawing up quarterly budgets for five quarters, re-assessing it at the end of each quarter and make changes where needed. In order for organisations to become more responsive to the changing needs of the customers, the budgeting process must be addressed for organisations to become more Agile. As Bjarte Bogsnes has pointed out: “One of the most stubborn myths in traditional management is that the only way to manage cost is through detailed annual cost budgets, with a tight follow-up to ensure that no more is spent than is handed out”. The lack of flexibility can lead to wasted resources and effort if it no longer responds to the customer’s need. To bust this age-old myth, organisations can benefit from transitioning from a traditional budgeting process to Beyond Budgeting. Beyond Budgeting is the practice of creating shorter rolling budgets and reviewing them at regular intervals. No matter what team you belong to, a company survives on delivering value to their clients. If your team is constantly looking to improve their work according to the customers need in shorter intervals, then the budgeting within the organization must match the strategic vision. Toyota – the car manufacturer, for example, made resources available just-in-time to meet each customer order. 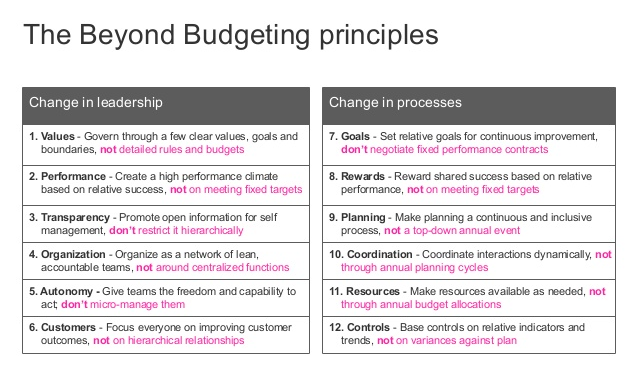 Beyond Budgeting allows more room for flexibility and improvement at shorter intervals. This process ensures your ideas responds quickly to customers idea and deliver value. By embracing Agile, it is not a call for companies to abandon the construction of a roadmap. It is still essential for companies to adhere the iterations to a long-term goal. For me, this goal should be accompanied by a cost-conscious mindset as well as making resources available as needed. Traditional budgeting in many ways has obstructed the nimbleness of companies. If other teams and projects can adopt Agile to become more efficient, it can lead to more valuable outcomes for the customers. Imagine chewing a piece of gum and watching TV at the same time, it’s easy to do both at the same time right? Now try to engage a conversation with someone and reading a book at the same time; it’s an impossible task to focus on both. The idea of “multi-tasking” has always been a buzzword in the business world. However, when we try to multitask, it diminishes our brain’s ability to focus and maintain attention on a single task. When we try to multitask too much, we won’t perform those tasks well, as our brain will try to take in too much information. This idea can similarly apply to the workflows of any non-software projects. Kanban methodology has taught us that we should limit our work-in-progress.Instead of juggling 10 tasks at the same time, it’s much more productive to focus on at most three tasks at hand. Any other teams should also possess a “stop starting, start finishing” mindset. According to the graph above, by distributing time on different projects, it’s actually reducing time in each project and creating waste that is not necessary for creating customer value. 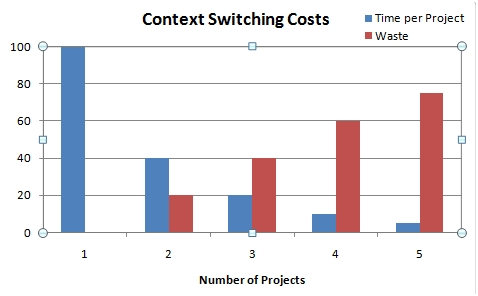 Jerry Weinberg, a computer scientist has shown that even if you account for a 10% penalty for each context switch, in reality the cost is even higher. Even as Agile preaches the positives of forming a cross-functional team, team members should not seek to multitask on different projects with a wide spectrum of context. For example, when a team member leaves to do work that is not related to the team’s work, the rest of the team has to compensate for the time lost as well as helping the returning member to catch up on the context in his/her absence. Through setting WIP limits, it helps teams to reduce context switching and avoid slowing down the team with an ever-expanding scope of work. This practice also reduces the number of mistakes committed by teams overloaded with tasks. To encourage non-software development teams to embrace Agile, it’s important to demonstrate the value and cultural changes that an Agile approach can deliver. I would seek to explain these valuable outcomes with the implementation of Agile Marketing. Agile Marketing can be defined as an Agile approach in which teams “identify and focus their collective efforts on high-value projects, complete those projects cooperatively, measure their impact, and then continuously and incrementally improve the results over time”. Since the approach embraces rapid iterations and data-driven decision making, it ensures your marketing investment is being optimised. 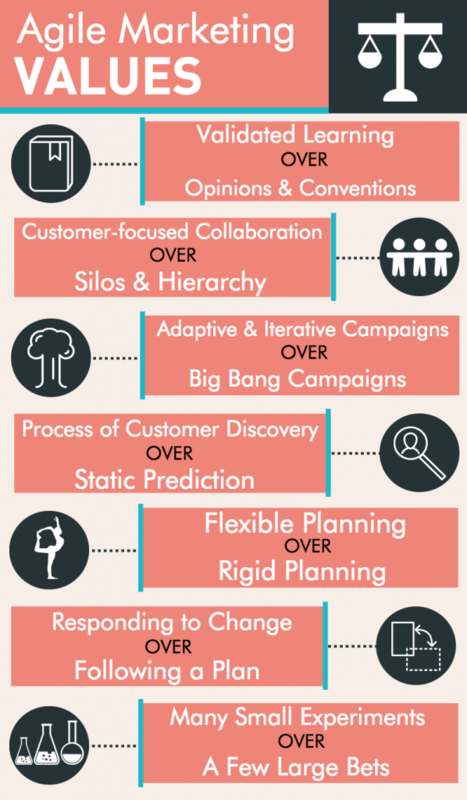 To implement Agile Marketing, a marketing team should seek to develop flexible roadmaps of projects and tests instead of rigid upfront planning that is not adaptable to changing conditions. For example, a marketing team can release a part of a marketing campaign to selected users. Through this approach, the team can collect valuable data and user metrics to determine their likes and dislikes. The collection of this data will also help the marketing team to continuously improve their content. Agile Marketing embraces the visualisation of the team’s current workflow. The transparency of the project is amplified by increasing communication and honesty. Agile supports the team to collectively own the process of the project and encourage them to speak up and contribute to the project vision. With the aid of project management tools, stakeholders and team members can be aware of what’s going on at all times during the project lifecycle, including the team’s responsibilities and how money from clients is being spent. In addition, Agile Marketing serves as a risk buffer, as companies no longer have to pour in huge funds into a single marketing campaign that users may not be attracted to. As long as you can help your teams improve their communication and workflows, you are one step closer to Agile success. In reality, there is no one-size-fits-all approach to introduce Agile to your non-software development projects and teams. Most importantly, don’t be afraid to experiment with Agile. You should not coerce your team into an approach that does not fit their need. You should strive for continuous improvement, and never be complacent about adopting new ways to implement Agile with your non-software development projects and teams. Experienced Scrum Master at PALO IT Hong Kong, Thomas has developed strong analytical thinking and conflict resolution skills. He is highly energised when it comes to helping product development teams to improve the way they work. Thomas is always keen to implement and experiment with the latest Agile practices. Take the start of La Route Du Rhum with PALO IT!